Lockheed Martin (NYSE: LMT) and the Defense Department have reached a “handshake agreement” for the company to produce 141 F-35 fighter aircraft for the U.S. and foreign partners, Defense News reported Sunday. Ellen Lord, defense undersecretary for acquisition and sustainment, said in a statement the joint program office and Lockheed are in the final negotiation phase over lot 11 of the F-35 contract. “With each production lot, the F-35 unit recurring flyaway costs continue to come down across the board,” added Lord, a 2018 Wash100 recipient. A spokesperson for Lockheed said the defense contractor remains on target to reduce the cost of the F-35A conventional takeoff and landing variant to approximately $80 million per unit by 2020. The Wall Street Journal reported that Lockheed could book in the third quarter of 2018 the majority of the contract that is likely to be worth at least $12 billion once a deal is finalized. Despite the drop in F-35A unit cost, DoD leaders are seeking larger cuts as production each year jumps toward 150 aircraft in the early 2020s. 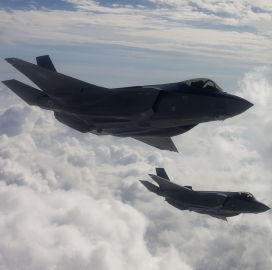 The report added that Lockheed wants to encourage the Pentagon and lawmakers to pursue a single multiyear contract to procure hundreds of F-35s in the early 2020s in order to achieve economies of scale. The preliminary deal came nearly two months after United Technologies Corp.’s (NYSE: UTX) Pratt & Whitney subsidiary received a potential three-year, $2 billion contract modification from the U.S. Navy to produce the 11th batch of F135 engines for all three F-35 variants and more than a year after Lockheed and DoD finalized an $8.5 billion contract for 90 lot 10 fighter jets.